You have a beautiful example and all the right modifications! Thank you! I have admired your Targa for quite a while too - it was always a toss up during my search whether I should go coupe or targa. Coupe happened to be the first that popped up, but I still have a serious soft spot for the targas. thanks for the photos and posts! entertaining and I'm glad to know about the car and the updates! Welcome to the club Jarod!! Thanks Rob! I ordered the poster from eBay a couple weeks ago but has yet to arrive. Apparently production actually started at 61 for the 964 run, so if you subtract 61 from 307 that would make your car the 246th example (and mine the 263rd). Have not been able to confirm if this is true or not, though. Thanks 9six4! Are you the same 9six4 I was chatting with on Instagram the other day about the New York trip? Thanks Jarod! Coupes are certainly going to have their benefits as far as chassis stiffness and realistically they’re less costly to maintain as the Targa tops by now all require some form of restoration to eliminate air/water leaks. Enjoy your car and make sure to update as you continue through your journey. Great post! Welcome to the forum, you've done a great job so far getting it dialed in. Subscribed! Awesome story! And kudos to you for methodically saving to get what you want. I had a similar story - although I think my love for Porsche 911's started from playing Test Drive 1 & 2 on my PC as a kid (anyone else remember that?) - I was probably 10 or 11 at the time. At 22 I bought a 1984 Guards Red / Black cab (I'm definitely a cab guy) and I absolutely loved that car, fulfilling a childhood dream. Ended up selling it sight unseen to someone in Montreal actually. 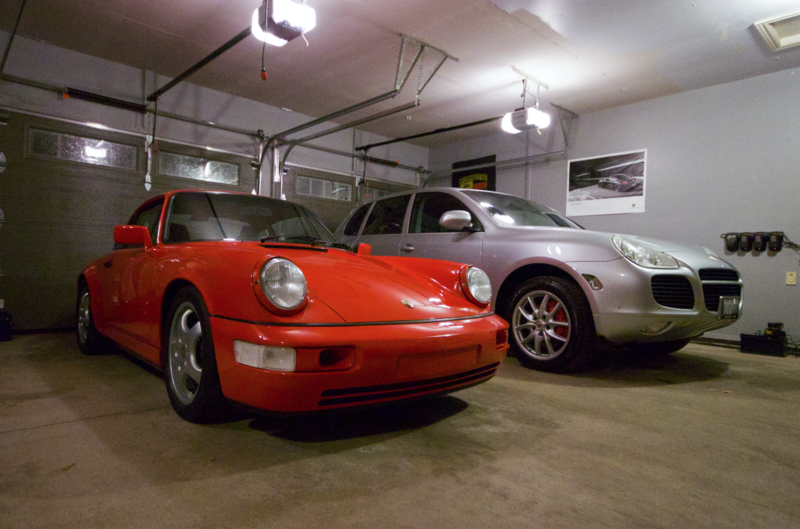 Many, many years later I now have a 964 cab which was always the car I sought after when I owned the '84.. I longed for the smooth bumpers and adjustable spoiler - just made the car look so much more modern to me. I'm sure you will run into a fair amount of 'haters' thinking it's daddy's money or some other reason why you have a Porsche at 20 - but all those people just inspired me to work harder. I don't know what it is about 911's... I've had plenty of nice cars, but I definitely get more of the dirty looks from people when I drive the 911. Thanks for the kind words. I am fortunate to be surrounded by a really great friend group, and try to do a good job at blocking out any negativity, so I've actually been very lucky so far to not have too much hate coming my way. I find the only people who judge are the people who pose no relevance to my life in the first place - you're right, it's mostly dirty looks in traffic (cops also assume it's Daddy's car). The strangest time was driving my Cayman to high school...thats where the real rumours lived, but you learn who your real friends are. I certainly believe my Dad has given me the car, but not in the form of money, but instead in the form of teaching work ethic. At the end of the day you will usually catch me in jeans & a baseball cap driving my 10 year old rusty beater BMW, the Porsche's have always been for my enjoyment and not to please anyone else (though letting kids sit in the cars has become a new favourite of mine...I hope some of them will get the same spark I did with the brand). A small semi-related thread update. Ordered an FVD exhaust for the 964 today as it sits tucked away in winter garage storage. As well, today was a bit of a tough day as the 964 lost it's long-time garage mate - my Cayenne Turbo has been sent off to it's new owner in California. Serious sellers remorse right now, but the new owners are very excited. I will post another thread on that Cayenne's life story as it's certainly an interesting one, and much longer than can be posted here, but it started life in Jerry Seinfeld's Porsche collection, then went to another notable Porsche collector in LA, who sold it to someone in Toronto (then eventually landed in my hands), and has subsequently been bought back by the 2nd owners! Anyway, time to hit AutoTrader and find another Cayenne to fill the void. Very nice C4 Jarod! Congrats to your purchase! Since the first 911 rolled out of the factory, guards red has always been the best looking color IMO. On a sporty Porsches. A GT3 or a GT4 still looks amazing in this color and it won't change. Not as young as you, but I was 25 when I bought my first 911 ( a Ruf-ed, slighty strosek-ed 3.2 WTL cab, had to be educated about 911s...) and am 29 now, now for 2 years owner of a black currant pearl 1989 964 C4. I am thinking the same way about the car as you do: it has to stay OEM-ish but has to have some serious sportiness to it so RSised it goes... That's why it has Cup1s, Aero mirrors, RS-ish stance/alignment and air intakes/rear RS bumper. I chose a dished wheel from Renown, because I have leather Recaro Pole Positions in it and have long legs. My IG is @n1ne11 if you want to see some Alps&964, come by say hello, I'll follow you as I will surely find interest in some of your mods to come Greetings from Switzerland! PPs were my first investment, as the car didn't come with it's original seats but with old Sparco's that were bleached out from the sun and were heavy/chunky. I will just have one advice for your about the PPs: go see them in real/ask a friend about his or so. I know that my friend and I we were so disappointed with the Gen. Leather version of the PPs that we had to force them to confirm our seat order. The quality and tone is miles away from a real leather seat like the ones we had in our 964s. We joked about it beeing an "Audi leather". We paid +80% on base PPs just for the leather version, so you will have to judge for yourself if it fits your requirements. Otherwise I also made the error to not test fit them, so it needed a bit of time and cushion deleting to fit in correctly, especially with helmet on on track days (I am touching the sunroof and am 187cm). I also lost almost 20 pounds so the shoulder/side thiness of the PPs doesn't bother me too much now and they are pretty comfy for bucket seats. I have the original Recaro rails + mounts if it helps and the seatbelt receptacle may be quite low after mount, so you will have to either create a new mount in the tunnel or adapt something by yourself. There are a lot of infos about that on the Rennlist 964/993 forums. I choose the FVD steel plate that makes the receptacle longer. The RS bumper doesn't have the upper lip on top of the plate. That's the main difference to me, maybe the plate area is larger, I don't know. Also I have an RSR front lip but I would take the original one as well, just doesn't bother me at all. Adds some sportiness in OEM fashion so it's OK.
Aero mirrors just give the last touch of 90s sportiness to the 964. I like to think that flags go with D90 as much as aeros go with Cup1s, so If I change one I'll probably do the other too. But that's just me.